Arroll cast iron radiators, a Belfast engineering firm - take their name from the shipbuilding engineering heritage of historic Belfast. The iconic Arroll gantry, named after its designer - a Scottish civil engineer and bridge builder, is located in the Harland and Wolff shipyard. When the Arroll Gantry was built it was the height of engineering design and craftsmanship and produced ships including the RMS Titanic. 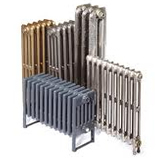 Arroll Cast Iron Radiators today use the same engineering skill and attention to detail for this inspirational range of designer cast iron radiators.